Learn more about the history of freestyle football. Freestyle Football is a way to express yourself throughout football tricks. There are uncountable different versions of tricks which can be performed in this sport. The tricks usually are done with the feet, head and the hand. One of the most popular tricks is the "Around the World" which is also performed by multiple football stars like Neymar and Ronaldo to warm up before a match. Unfortunately most of the other tricks in freestyle football are far more different from the classical football. Even if the name hints to classical football, the sport freestyle football has no direct link to classic football on the pitch and is therefore a sport on its own. Freestyle football is a young sport which exist for about 15 years. Throughout the years, freestyle football got more popular and professional football freestyler like Ricardo Rehländer got more and more famous. The root of classical football juggling is traceable back to famous circus artists like Enrico Rastelli or Francis Brunn from the last century. At these days, football juggling was not a sport back then, but more part of their circus entertainment program. The first big steps into freestyle football history were made by world famous football legend Diego Maradona. Beside his fantastic skills on the pitch he was also well known for his warm up routines before the start of a match. Maradona juggled the football for minutes on his head, shoulders and feet. The next football generation caught up with Maradonas tricks and footballers like Brasil football star Ronaldinho got global attention with commercials from NIKE and other sport brands, which carried the tricks of football freestyle in the world. To this day, Freestyle Football has become a established sport around the world. Even if Freestyle Football is still sort of an underground sport, it is rapidly increasing in many countries. 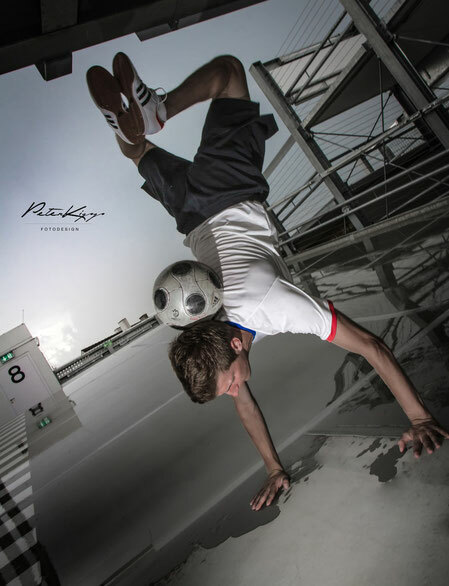 Nowdays, professional football freestyler like Ricardo are booked from numerous companies to show their skills at big events.